Jewish Poets on Jewish Poets: live Jewish poets reading dead Jewish poets. An interesting concept, I thought. I'll go. June 2015 was quite a great month for art and writing at the Contemporary Jewish Museum. Envisioned by poet Bill Berkson, the reading was made possible by his friend, also a poet, Chief Curator of the CJM, Renny Pritikin. The auditorium was cool and high-ceilinged, spacious without feeling cavernous. About one hundred movable, blue padded chairs faced a podium and lectern. A rotating slide show of photos of poets no longer with us gently played across a huge screen. To the side stood long tables displaying books by the living and the dead, staffed by gift shop workers. The seats filled slowly. Mr. Pritikin informed us that we needed to start on time, not "poet time" (which I know from childhood as "Jewish standard time," but perhaps he didn't want to say). Over the next hour and a half, people, mostly in the over-forty crowd, trickled in and occupied nearly all of the seats. Mr. Pritikin introduced the evening. "There are nine of us," he said. An audience member called out, "Not a minyan!" Mr. Pritikin smiled a little, but also seemed a bit pained. I didn't see Maxine Chernoff, who was listed on the website and who I knew from my graduate studies, but perhaps she would come later. I had hoped to say hello. She had been gracious enough to let me include her then-unpublished poem, "Edge," for Star 82 Review in 2013. But that was not to be. She was not mentioned during the evening. Maxine would have made ten: the minyan. There was no program, so I have to write from my notes. My thoughts follow the list. 1. Renny Pritikin read from Joel Oppenheimer's, On occasion: Some births, deaths, weddings, birthdays, holidays, and other events : poems. 2. Suzanne Stein read Gertrude Stein because of their shared name. She read from Stanzas in Meditation. "I wanted to do this because it would be hard for me," she said, which made me laugh, which in turn made the woman across the empty seat next to me laugh, but I'm not sure other people noticed how amusing it was. 3. Alan Bernheimer read from Robert Desnos (b. 1900), a surrealist and dadaist who was eventually sent to Auschwitz, then to Terezin, where he died of typhoid. Bernheimer told a magnificent story from an article by Susan Griffin, about how Desnos saved a group of men, including himself, from the gas chambers by reading their palms. Bernheimer then read from the poem "Midway"with a line that took my breath away: "Thru empty streets at night / Drops a marvelous tomato that rolls in the gutter / To be swept away later." The bright tomato—no the "marvelous" tomato—is a bright spot in the center. This poem may be in The Voice of Robert Desnos: Selected Poems. I need to read a paper book of Desnos's. 4. Susan Gevirtz read from "Tannais" (sp?) in Collected Poems of poet Iossif Ventura, considered a patriarch in Greece. 1986. She would read, she said, three pages from one book, then from her own translation. The three pages were lists of names of Greek children and their ages, who died in a cargo hold as they were being taken by the Germans to a concentration camp and were fired upon by the Allies, who did not know what was contained within. 5. Norman Fischer read from several poets. Edmond Jabés (The Book of Shares), which included the lines, "to read the erasures under the writing" and from a compendium, a description of the "endless unrolling" of parchment, referring to the Torah and life as a Jew. He also read the 1962 jazz-based and very rhythmic, "19th Light" by Jackson Mac Low from The Complete Light Poems. 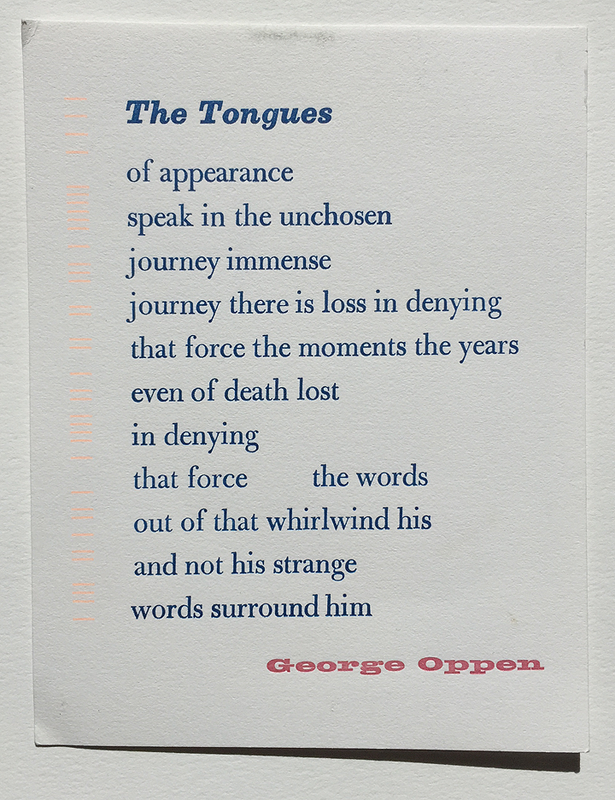 Lastly, Fischer read "from a card he received from Poltroon Press," a poem called "The Tongues" by George Oppen, which had the lines, "journey there is loss in denying" and "strange words surround him." I wrote to the printer, my friend Alastair Johnston, who kindly sent me the excellent card. Interesting where the breaks are. 7. David Meltzer. Although he was on crutches, he seemed at ease in front of the audience, as if we had dropped by his living room. I liked him immediately and want to read his work. He read from Else Lasker-Schüler: "The Blue Piano," Rose D… (?) "The Choice." The last poet was someone who had submitted to his long-ago magazine Tree and who he liked so well he published a whole book just of her poems. 8. Norma Cole read three translations of "The Lorelei" by Heinrich Heine: one by Mark Twain, one by Emma Lazarus, and the third was her own translation, which was funny and modern and winked at you. I liked her as well. The memorable phrase that repeated throughout was a version of: "She combs her golden hair / She combs it with a golden comb." The Lorelei is a high rock on the Rhine river in Germany whose position causes it to murmur. In mythology: a beautiful water spirit who sits on top of it and sings, distracting sailors then who crash on the rocks below. 9. Bill Berkson wrapped it up by reading from Charles Renikoff and F.T. Prince ("Testimony"). He wore a memorable hat. Choosing what to read is like choosing clothes that someone else has made but knowing that your taste will show. With each choice and presentation style, each poet revealed their own inner voice. The choices appeared individually as a mask, a mirror, a window, or frame. A mask replaces one's own face. A mirror shows it. A window admits newness. A frame points, enhances, and underlines. Did they want to appear earnest? charming? funny? Did they know their style was nostalgic, intense, serious magical, playful, or ironic? Part of what drives a reading is the desire to teach, celebrate, and/or the desire to entertain. Did they succeed in communicating? Yes. Was it what they intended to communicate? I'm going to leave that open. Many of the poets are luminaries in the field, many are teachers, so I would hope so. I dutifully filled out my questionnaire regarding the event. It was only later that I realized that seeing each tiny poet reading in front of a voluminous blank screen (the slide show ended once the evening was introduced) exposed a missed opportunity. 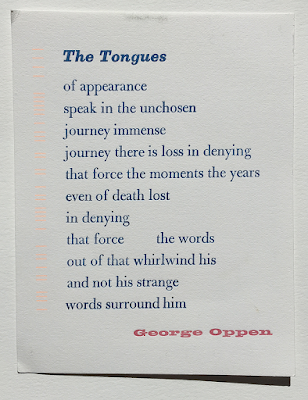 When each poet read, a photo of the author could have been shown as well as a list of the poems or quotes from the poems, or some visual cues, perhaps related art by Jewish artists. While I can't say I was entertained, I can say I was thoroughly educated, my brain challenged and teased, my heart strummed. This is a good thing. I know of some poetry I will read next. I close my eyes and strange words surround me.